There will be no sunday review next week as I'll be at Emerald City Comicon with Torvald and my evil twin. I'd also like to point out this review of TODAY THE WORLD IS WATCHING YOU I did earlier in the week. The review copy was from NetGalley which provides pre-publication review copies to readers from various publishers, mostly via ebooks. This book was in PDF form, I've got two more from them that are on my Kindle. Being Human : "Type 4" - A zombie joins the house despite a bad stink and obnoxious behavior, Nina and George have a little problem, and Mitchell gets a stalker. It's amazing how this show goes from incredibly funny to touching and emotional in moments. And this episode swings back and forth in an instant. Being Human : "The Pack" - While Annie and Mitch get to know each other, Nina and George seek out advice from MacNair. I like Nina more and more. And her willingness to let Thomas know that MacNair was lying to him just made it better. I'm disturbed by Mitch's continued inability to admit his recent crimes to his friends, as it's clear that's the key point in this entire series (season). Being Human : "The Longest Day" - Herrick returns and causes chaos. Not a lot of humor in this one, as Herrick is a nasty character in that nastiness grows around him. The dilemma that George goes through in this episode puts him right up against Mitch, and it worked well. Not much humor, no. Who Do You Think You Are? : "Rosie O'Donnell" - I agree with hubby-Eric after watching this: let's get more comedians on this show. Rosie also does some deep digging to hunt down some mysteries in her family's past. Her great-grandfather's first wife's story was stunning, as was the reaction of her cousins when she met them. The trip to Canada was neat enough, but then she headed to Ireland and found more mysteries. A good episode. Brightest Day #16 - I'm so far behind that I've seen spoilers for how this part of the storyline ends and I'm just starting to read it now. Still, pretty cool bits of Jackson and Aquaman's lives. Green Lantern #60 - Well, we know who's behind the stealing of the entities, now. Green Lantern: Emerald Warriors #5 - I can't believe how little interest I have in how this storyline turns out. Green Lantern/Plastic Man - Cute little tale. Of course the aliens have to look like ducks if Plas is involved. Birds of Prey #7 - That was extremely unwise of the birds to take Dove to that place for her birthday. Just saying. Although I enjoyed Zinda's... remarks. DMZ #60 - And now we see how the war began. It's chilling, and yet not so impossible to believe anymore. Soldier Zero #3 - So, the first hybrid meets another one, and they fight. Yup. Not feeling the excitement yet. My library book this week was To Kill A Mockingbird by Harper Lee. Awhile ago, hubby-Eric and I watched To Kill A Mockingbird and I enjoyed it quite a bit. But then I sort of halfway joined a book club, and was told this was the book they were reading. At that point I realized I'd never read it in school, so I'd better get cracking on it. The framing of the story is how Jem broke his arm, but of course the narrative takes a very roundabout way to get to that part of the tale. The narrator, Scout, is looking back on her childhood as an adult. She tries to tell the story as she saw it happen, but her outlook on events is definitely mature compared to Scout's naivity of the time. I found the picture this book painted of the town and its people to be surprising, different than I was expecting in many ways. They weren't as, excuse the expression, black and white as I had felt they would be. In the end, I'm very glad I read this, and pretty glad I've seen the movie as well. Let's see if I can read the next book the book club has assigned... David Copperfield. Agatha Christie this week was Endless Night from 1967. A young man tells how he acquired Gipsy's Acres and what it cost him. It would be really difficult to write much about this without giving something away. The book started slow, and was pretty slow all the way until the final part, then it disappointed me more than a little. It's not my favorite by any means at all, and in fact is fairly close to the bottom for me. I hope the next one is better. Fortean Times #268 (December 2010). I'm well behind on reviewing these, for once not because they are late but because I got a Kindle and stopped reading everything else for awhile (which is also why I'm behind on the comics). Let's see, this is a standard issue, lots of good stuff, wierd stuff, and some stuff that can gross you out. Some highlights: The Renfrew ghost video is so clearly a flare on the lens (it moves with the camera) that I can't believe even a ghost hunter would put it up as evidence (YouTube). The pictures of the giant tumor and kidney stone were enough to turn my stomach. The UFO files was good, and has been particularly good the last few months. 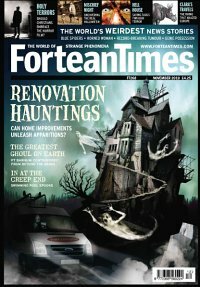 The cover article is about the connection between home renovations and hauntings, and was an ok overview. There didn't seem to be a lot new there for me. Another good long article is about the link between Christianity and Horror, and covers a lifelong horror fan who became a Christian and retained his love of horror. It was a different angle on the subject than I expected. Mischief Night is covered in a history article that I found extremely fascinating, as it is a tradition that doesn't really exist anywhere I've lived. And another article discusses a possible attempt to steal Barnum's body from his grave. The reviews were excellent as usual, and for the first time I looked for Kindle editions of the books I thought I might be interested in if I could find them in that format. I was able to locate three of them to add to my Kindle Wishlist. The letters were the usual high quality, and "It Happened to Me" as freaky as I normally find it. The comic page was a new one for me, "The Cryptid Kid Investigates", and it wasn't bad. Overall, another good issue of the best magazine out there.